A couple of closeup sketches of various bits of the wife for you this evening. 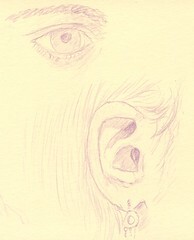 Nothing exciting, an ear and an eye. In a sort of purply colour as I think it complements the yellow of the paper.